It is the seventh birthday of the most popular FIFA game mode. Celebrate 7 years of FIFA Ultimate Team with free packs and find out this week’s special FUT 16 events. To celebrate FUT’s seventh birthday, FIFA Ultimate Team will be holding special events throughout the week. Everyone loves free packs. And EA know it. As a thank you for your support, they are giving away free packs to all FUT 16 players. Between March 21 (Monday) and March 28 (Monday), you will get a untradeable pack in your account, one per each day. You just need to go to your PC or console and open your FUT store. You can use the Companion or Web App to get your free pack. Remember to claim yours each day because they don’t carry over. You can not sell them and the discard price is 0. These packs should be available for everyone except for mobile players. A new free pack is announced every day at 6pm (UK time). Don’t forget to share with us in the comments section what you pull from these free packs. 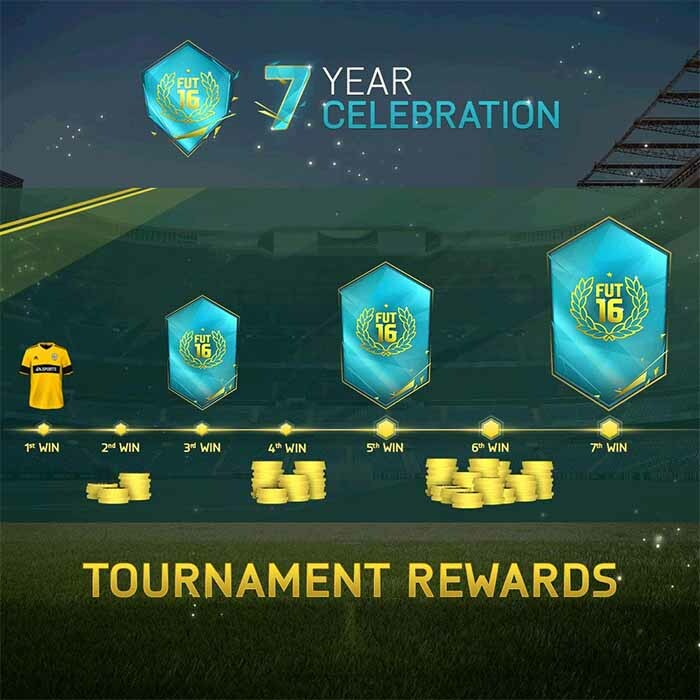 To celebrate the seventh FUT anniversary, EA released a great tournament. You can win it up to seven times and get ever-increasing rewards. The very first online winning reward will be an exclusive EA-branded kit for your club. The FUT Birthday Cup starts at March 21 6pm (UK time) and ends exactly seven days later at March 28. The only requirement to play is to not repeat nationalities. 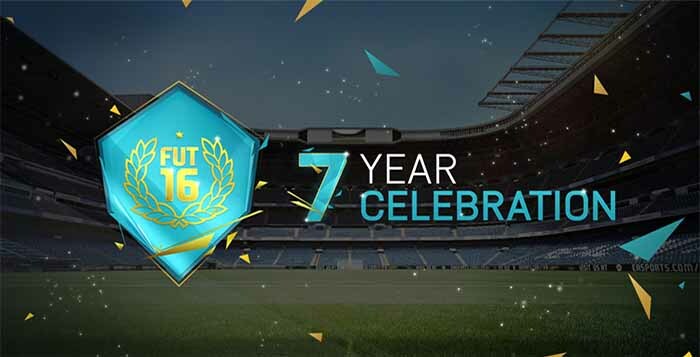 You can know more details about the FUT Birthday Cup clicking here. As usual in these special occasions, new pack offers will be available every day. Starting at March 21 and until March 28, a new Happy Hour will be released at 6pm (UK time). EA Sports has not announced which Happy Hours they will release, but it is easy to guess that they will release the most common ones: 15k, 25k and 35k during the week days and eventually 50k or / and 100k packs during the weekend. You can expect a new pack offer every 7 hours. With all these offers, we may expect a drop in the cards’ prices this week. You can check all the packs offers clicking here. 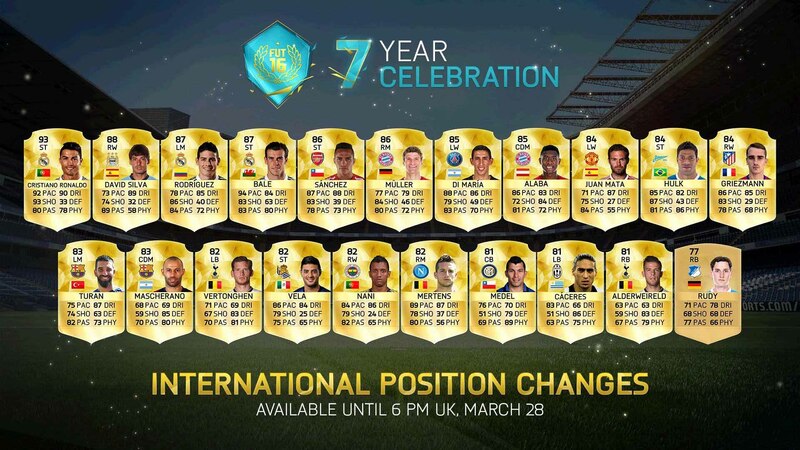 During this week, there is something that will happen for the first time: EA Sports will release the 21 cards that you can see in the picture with the player’s international positions. It means that only until March 28, you will have the chance to pull a NIF Ronaldo ST or Hulk ST from a pack. After this week, all the players will be released in their usual club’s positions. Hi, I did not receive free packs what do I do? Hi Rodrigo. Is upgraded Bellerin the best RB option in the BPL now? I still believe that Kyle Walker is the best one. Luiz Gustavo is my weak link, so any suggestions for a replacement / switch around? not many good brazilian CMs. Nice team but you should try to improve the individual chemistry. There are no free packs today. If you check the list of this page it ends on March 27. The 7th anniversary celebration is over. I have been wisiting your home site for a long time, and i must say i have become a big fan of your site (home page)… you are doing a very good job and thanx for all the good advice you are sharing with us other fifa fans. Hi. Thank you for your support. Maybe you could use Boateng to get a perfect link with Neuer and keep the rest of your team as it is now. No. The celebration is over. I packed Diego Costa and IF Fernandez. But will we get another pack today. 28 th. In the daily pack i packed Ibra. At first i was a little upset i can’t sell it, but then i made a ligue one team around him and he is a beast! He wins matches by himself! I belive ea will realease FREE 50k pcks. We too. And they did it. Should i wait for tomorrow or buy players for cheap right now? Is the kit you win in the tournament untradable? You can sub him in on 10 cem ingame! That’s a good suggestion. You will spend an extra contract but it will worth it. So does that mean during these 6 days left, the prices of players will slightly go down? Happy hour will bring more cards on the market so yeah I would assume the prices will slightly go down.